I knew the risks of having a child in my 40s, and I intended to love and care for every child God blessed us with, no matter what. Still, when Sonya was born with Down syndrome I was stunned. Recognizing that having a special needs child in our family would dramatically change all our lives, I took her home and loved her just as much as my other ten children. In a few short weeks we all became crazy about her! Even my sons became more nurturing. Our family doctor, our family, and friends were very kind and encouraging. For months later, so many people immediately wanted to give me advice, share their sympathies, or sell me a product, that I let the older children screen emails and take phone calls. The quiet time bonding with Sonya and pleading with the Lord to help me figure out how to parent a child with special needs was precious and comforting. As she got older, other than a hole in her heart that closed on its own, Sonya was generally healthy. Physically, though, by the time she was almost one, she couldn’t do much but sit up, and I could see she wasn’t progressing. She was like Jello, a beautiful big baby with some muscle, but barely able to move her limbs. Sonya had plenty of people around to entertain and love her now, but what about her future? I had many questions that reading and research alone could not answer specifically for my daughter. Success testimonies were encouraging, but did not give me the how of parenting a special child I was looking for. What was her potential? Should I have her IQ tested? I worried about people ridiculing her, and if she would even be aware of it. I worried about how much she would be able to care for herself in the future. I wanted so much to help her and to protect her. We had the resources, but no direction. Our family doctor had recommended that I look into Early Childhood intervention—a completely new concept for me. But I didn’t consider the idea, because I didn’t know Sonya needed specific stimulation for her necessary development, and because, as a homeschooling family, I didn’t want the involvement of the state. Right about that time I was introduced to an NACD family and found myself suddenly picturing new possibilities for my little girl. Bob Doman’s statement that every child has unlimited potential was just what I needed to hear. It gave me hope for Sonya’s future. Reading the NACD stories of children and parents who worked to accomplish their successes helped me to trust that this organization was not just offering “a magic pill” or empty promises. I knew that it would take work, and I was willing to rearrange my life to help Sonya. Our first NACD evaluation was simply amazing! Lyn made me feel as if Sonya was the most special child in the whole world. I could tell Lyn was excited about the work she was doing, and her sincerity was heartwarming and encouraging. Lyn was not mystified by my daughter. She could tell exactly what Sonya needed and which steps to take first. She had answers for us! A family-based approach was just what we wanted, too. We wanted to be part of the solution and just needed guidance. I’m glad we videotaped the first evaluation for our other children, to help them understand what NACD was all about. Now they take turns coming to the evaluations with us to be encouraged about the daily work they have done. All of our children feel free to share with Lyn about their observations or concerns about Sonya. We look forward to every evaluation to get the reassurance and proactive help we need. As we started seeing results, we became more convinced that we had found the right path for Sonya. Lyn would predict that certain changes or obstacles would come with different developmental stages, and she was always right on target. We have become very grateful for not only Lyn’s guidance and counsel, but also her friendship. Implementing the NACD program became and still is a true family affair. Being a bit of a graph and data fanatic, I made a color-coded program chart and used assigned numbers for all the children so I could easily keep track of who completed what. Then I divided the program activities among the ten siblings, who took turns working with Sonya. Dad also helped as best as he could by making therapeutic videos while fulfilling two jobs to support the family. One of the first things we did was to begin teaching Sonya to crawl. And although she initially wasn’t thrilled about it, she eventually enjoyed the attention of her older brothers and sisters. As soon as she began developing more muscle tone, I knew we had to keep going with the NACD program, even though that meant I had to tweak my homeschooling style. For example, for the previous 25 years I had taught my children to read using phonics; so when Lyn said we were going to teach then almost three-year-old Sonya to read with sight words I thought, “Are you nuts? She can barely talk!” But Lyn explained that reading would actually help Sonya develop more speech, and she showed me how to make teaching the NACD way fun and stimulating. How wonderful it was when just in time for her birthday, after only a week, Sonya could read her first words, like “cake,” “party,” and “presents.” Sonya, the child with Down syndrome, was reading at an earlier age than any of her siblings! When Sonya was about five, one of her doctors wanted us to check with a physical therapist to see if taping would help her knee. The physical therapist, however, had to do a thorough evaluation of Sonya before we could even make an appointment to address the question. The PT didn’t think the doctor’s concern was a problem at all, but she saw a few other issues with what Sonya “wasn’t doing” at her age. She focused on specific activities that “a typical DS child should be able to do” and wanted to design a separate program of therapy for Sonya, which meant coming to the office 2 days a week. Because she hadn’t heard of NACD before, the PT was skeptical and didn’t understand what we were doing for our daughter. Although she didn’t challenge us directly, it was clear that her opinions conflicted with the NACD philosophy. Oh, how that confused me! Was NACD the best I could do for Sonya? Was I messing up my child by not using the professional equipment available in the therapist’s office? Was I neglecting something that might benefit her more? Was I really giving her every opportunity? I began doubting myself and my capabilities. I emailed Lyn right away, and we discussed my distress about the evaluation and the fun tools the PT had. Lyn refreshed my memory of what we and NACD were trying to do and what we had already accomplished with Sonya. I realized at that point I had to decide to whom I was going to listen and trust. I knew we couldn’t do both physical therapy and an NACD program. PT visits would have caused Sonya to lose 5-6 hours a week of programming. Most importantly, if I had tried to listen to both the PT and NACD, the major differences would have created constant tension, confusion, and doubt. It would have been like trying to drive down a familiar road, while listening to the GPS device give audible directions to an entirely different destination. Since by then Sonya had been on program for over 5 years and we had seen so much progress and such global improvement—all predicted and orchestrated by NACD—I had developed a great relationship with Lyn. I already trusted her and NACD. Sonya’s doctor concurred with my decision, as it wasn’t her intention for Sonya to see the PT continuously. The decision to discontinue physical therapy was a relief, because I felt like I was no longer being pulled to walk two separate roads. The experience with PT helped me recognize that it was very important not to rush Sonya into doing what she wasn’t really ready to do just yet. It was more important that she walked correctly, not quickly; that walking wasn’t just moving from point A to point B, it was a building piece for a continual growth. Seeing that the physical therapist was focusing on symptoms, whereas NACD was programming Sonya’s brain, helped me resolve to trust NACD more fully from then on. Trusting NACD and Lyn’s articulate explanations of why we were doing certain things also kept at bay feelings of guilt for not following what was popular in the homeschooling community, like teaching Latin, or using the latest “best” math curriculum. I resisted involving Sonya in extra activities, such as sports and dance, and shut down noise that had the potential to distract me from implementing program. Because of that, Sonya has grown by leaps and bounds—physically, intellectually, and spiritually. One grandparent, who used to worry that Sonya would be pushed around because of her diagnosis, now brags about her. And with good reason! What is the end result for Sonya? Will she be able to drive, live on her own, get married, or take care of us when we get old? We don’t know. We do know that because of NACD, Sonya has become her own person, competent to do something worthwhile with her life. With the help of NACD, she has also developed the cognitive capacity to consciously accept God and this gives us tremendous peace. As satisfying as it is to have Sonya achieve academically, her character has always been our primary focus. 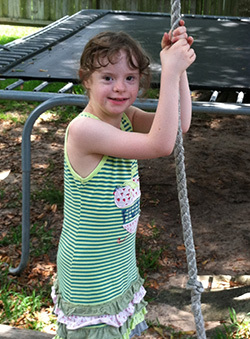 Early on, we decided to not make exceptions to our family rules and standards because of Sonya’s special needs. We expect exactly the same things from her that we did from our other children at the same stage of development. We have tried to develop self-discipline in all our children by training them to obey their parents and respect others. So instead of having to make excuses for her behavior in public, we have taught her to behave better than a typical child, while still allowing her to express her lively personality. Looking back, I am amazed that the little NACD program pieces we’ve been doing for many years have come together beautifully to make Sonya the incredible child she is today. Sonya’s improved abilities have enabled her to become less self-centered. She is not the merely passive, purely loving character many people predicted she would be. Wow! She has a personality! As soon as she was able, she exhibited a little “creative,” stubborn streak. As with our other children, we’ve had to teach her to be honest, to not argue, to obey quickly, to be diligent in her tasks, not to touch things that are not hers, to speak kindly and respectfully, etc. She is learning that life is not all about her and not about everyone helping and serving her. She has learned many skills that she can use to take care of herself in several areas. Even further, being included in household chores gives her a sense of belonging to the family and provides the practice and ability to serve others. While we don’t know exactly what the future holds for her, we see her accomplishing much more than her diagnosis would have allowed her had we not made the decision to work with NACD. For now, consistently implementing program is still very much a part of our daily life—color-coded charts and all.